In this photo taken Tuesday, July 24, 2018, provided by the Center for Whale Research, a baby orca whale is being pushed by her mother after being born off the Canada coast near Victoria, British Columbia. 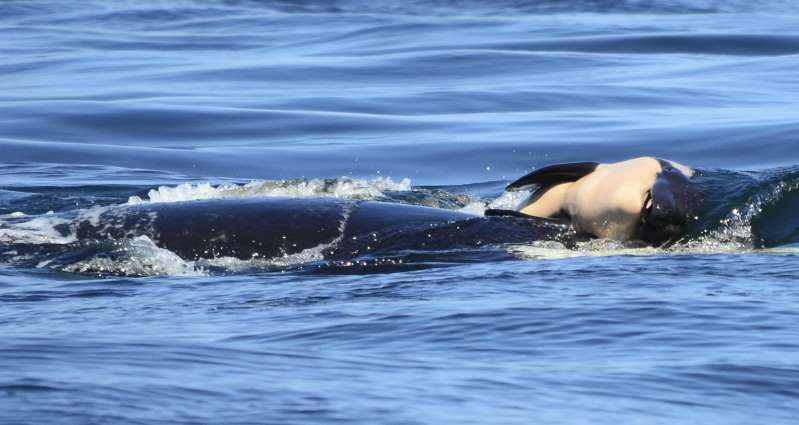 An orca has been spotted off the coast of Victoria, British Columbia, propping the body of her dead newborn calf up in the water with her head for two days, researchers say. "It is unbelievably sad," said Brad Hanson, wildlife biologist with the Northwest Fisheries Science Center, according to The Seattle Times. Deborah Giles, a biologist with the Center for Conservation Biology, told KCPQ that photos of the orca carrying her dead newborn are "heartbreaking." "She was grieving," Giles said, according to the station. "She knew it was dead." [post_ads]Robin Baird, a research biologist with Cascadia Research Collective, watched a similar incident unfold with another orca, also commonly called killer whales, in 2010, reported the Times. "It reflects the very strong bonds these animals have, and as a parent, you can only imagine what kinds of emotional stress these animals must be under, having these events happen," Baird said, according to the Times. The calf died within a few hours of being born Tuesday to an orca designated J35, from one of three pods of endangered southern resident orcas, reported CBC News. "I looked through the binoculars and I saw that there was a new calf swimming with them," said Mark Malleson, who first spotted the calf in the San Juan Islands near the Canadian border. He notified the Center for Whale Research at Friday Harbor, Washington, reported CBC News. But when researchers arrived, they found J35 trying to prop up her dead newborn with her nose, according to the network. Researchers again spotted her Wednesday carrying her dead calf on her head through the water. The southern resident orca population has reached its lowest point in decades, and the species is on the brink of extinction, reported KCPQ. Toxins, vessel traffic and loss of food, particularly chinook salmon, are believed to be responsible, reported the Times.